One of these journalists was our mother, Daphne Caruana Galizia. She was assassinated in Malta on October 16, 2017, when a bomb placed under the driver’s seat of her car exploded as she rushed to the bank to unblock her account, which had been frozen by the country’s economy minister. 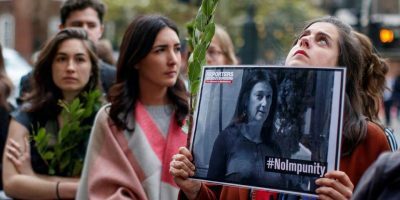 It was the last in a string of attacks she endured for her reporting, but not the last violation Malta would suffer for what she had revealed. A trained archaeologist, our mother uncovered a web of corruption linking major multinational deals, passport sales and a sophisticated global money-laundering operation, and tugged on the threads until they led her to the heart of Malta’s government. The result was not what she expected. Instead of resignations came reprisals. Pockets of institutional independence in Malta that had survived four years of populism were quashed. And our mother, a beacon of hope and courage for hundreds of thousands, including judges and law-enforcement officials, was executed in broad daylight. The people she exposed remain in public office, while those who campaign for justice for her murder are assaulted in public. By exposing the venality of the powerful in a place where institutions are little more than facades, our mother’s work triggered a backlash that killed her, and is currently throttling the country’s public life. Little wonder, then, that in 2018 Malta fell the furthest in press-freedom rankings in Europe, a region that itself experienced the fastest decline globally. The country also slipped in democracy rankings and rule of law indicators, and leads the field in hate speech. The impact of globalised crime and corruption is not limited to Malta and Europe, of course. In response, investigative journalists have banded together in global networks such as the Daphne Project. And the Panama Papers and Paradise Papers show just how effective investigative journalism can be in forcing greater transparency, undermining criminal networks and driving up the cost of political corruption for its perpetrators. But while journalists increasingly cooperate across borders, national law-enforcement authorities are still playing catch-up in combating crime and corruption. As a result, the impact of investigative journalism varies widely by country and over time. In countries where law-enforcement authorities are independent from the central government and private interests, and where the public can channel grievances effectively through responsive political institutions, investigative reporting can have an immediate impact on preventing corruption and state capture. But in countries lacking the will or capacity to root out organised crime and corruption, and with a public too polarised to unite against its enemies, compelling transparency and accountability can have perverse results. In such places, journalists continue to be targeted, with dangerous consequences both for local communities and the global economy. When journalists come under attack, it usually means that the societies within which they operate are so corrupt that their principal law-enforcement institutions and democratic checks have already been fundamentally compromised. This makes investigative reporters the last people left standing between the rule of law and those who seek to violate it, and it makes their work both more dangerous and less effective. The most recent phase of globalisation gave us Moneyland, a vast playground for organised criminals and kleptocrats that hoovered up weaker jurisdictions like Malta into the service of dark money. The right response to this is not to retreat behind national borders, but to create a new global entity designed to address the transnational nature of organised crime and corruption. For a start, law-enforcement bodies could learn from journalism and work more urgently to develop the trusted-network approach that organised crime has perfected. As the world seemingly enters a new phase of globalisation, we must not allow new opportunities to be extended to global crime and corruption. Otherwise, our collective future will belong to an alliance of dark money, disinformation and the sort of division that robbed our country of its most prominent journalist. Matthew Caruana Galizia is a journalist and software engineer who has worked on investigations into international corruption for the International Consortium of Investigative Journalists. Andrew Caruana Galizia is a global leadership fellow and strategic intelligence lead at the World Economic Forum. Paul Caruana Galizia is the finance editor at Tortoise and a visiting fellow at the London School of Economics.